The Great Western Trust (GWT) (Registered Charity 289008) was established by the Great Western Society (GWS) in 1984 to own, administer, conserve and display the smaller artefacts and memorabilia of the GWR Collection at Didcot Railway Centre. This deliberately focussed organisation has a unique, nationally significant collection devoted to the social and economic impact of the GWR, the constituent, absorbed and joint companies and the nationalised British Railways (Western Region) successor. The GWT has seven Trustees who are unpaid volunteers, who have to be GWS members and are individually appointed by the GWS Management Council. All seven Trustees are unpaid volunteers, who have to be GWS members and are individually appointed by the GWS Management Council. To establish as comprehensive and representative collection of artefacts as possible with the purpose that not only will that material be conserved and available to current and future generations, but displayed and interpreted in such a way that it demonstrates the whole extent of this vast transport undertaking, its operations and the impact it had upon its staff and customers. To maintain topicality and to minimise fatigue for displayed items, we annually refresh some display themes. This also allows us to exploit the otherwise hidden part of the collection. The vast majority of our collection has been donated by our visitors or by GWS members. Broadly it spans the period from 1833 (the First GWR Share Prospectus) to 1977 (when Diesel Hydraulic locomotives, unique to British Railways Western Region, were withdrawn). The breadth is vast including the building of locomotives and rolling stock through to the running of Hotels, Dockyards, Shipping, Air Services, Cartage and Buses. Also included is the organisation and welfare of the GWR staff and their wide ranging educational and recreational activities. It also covers aspects specific to Didcot and its locality. Finally GWT are custodians of the GWS’s own railway preservation heritage records from its formation in 1961. The collection holds significant portfolios such as the R K Bird collection ( which is probably the most comprehensive collection of GWR Publicity material in one place) and the bequests of Eric Mountford, Michael Hale, Mike Ogden and not least, Charles Gordon Stuart. The GWT Photographic Collection is vast. It not only covers the GWR and BR/WR but many other railways as well. Copies of images (scans only) are available to authors for publication or to the public for private use. Details of the collection can be obtained from the GWT Photo Archivist via E-Mail ensuring that ‘GWT Photo Archive’ is in the subject line or write to the GWT Photo Archivist c/o Didcot Railway Centre enclosing an SAE. 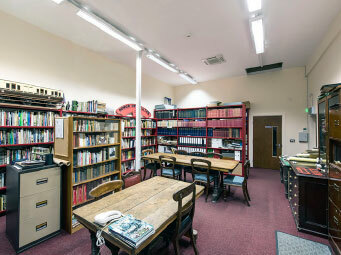 The air-conditioned GWT Reading Room and Library. Researchers have the use of this room during their visits. The GWT has now opened as an addition to the Museum Building a Reading Room and Library and an environmentally controlled Conservation Grade Store. The Trust is very proud of our facility and believes that we are the only railway society to have such a capability. Part of the temperature and humidity controlled Conservation Store. Kept here are the items that need storage in these conditions – paperwork of all descriptions, the GWT photographic collection and items such as leather horse harness and uniforms. 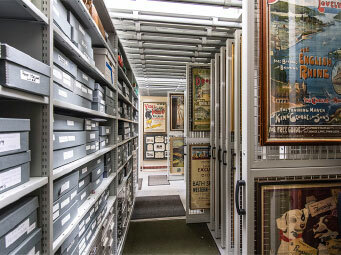 Items in the GWT Collection can now be viewed in the Reading Room by contacting the Trust and agreeing a Research visit. Visits are always supervised by a Trustee and are strictly by appointment. As part of the process of agreeing a visit, the Trust will establish what items in the collection will help you meet your research needs and also arrange, if possible, for a Trustee to be in attendance who has particular knowledge in that area. Only non-contact methods of copying documents are allowed. Under the umbrella title of Didcot Railway Centre, the bodies forming and administering it, including the GWT, have gained full accredited status under the Arts Council Of England (ACE) scheme. Potential donors can be satisfied that our Collection is subject to the best nationally recognised procedures.